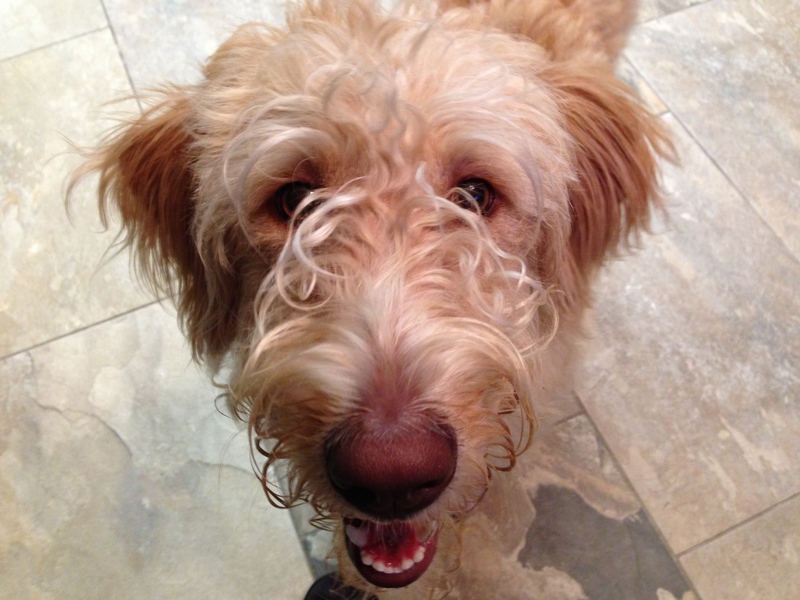 Pepper is a one-year-old female Labradoodle who jumps up on guests, pulls on the leash and gets over excited when seeing dogs while on walks. Whenever I have a client who’s dog is reactive to other dogs outside of their home, I always start out by evaluating the rules and structure the dog is expected to respect. There are a number of things that can cause a dog to be reactive to seeing other dogs; territoriality, insecurity or fear, aggression and excitement. My initial goal for the session was to determine which one of these factors was influencing pepper. I sat down with peppers guardian to discuss the situation as well as her day-to-day routine. As is frequently the case, Pepper really didn’t have a lot of structure in place. When a dog doesn’t have rules or structure in place, it often infers that it must be the one making the rules. This means the dog thinks it is in a leadership position and is often related to why the dog doesnt listen when corrected by their guardian. To start to change the dogs perception of itself in relation to its authority level, I suggested a number of simple rules, boundaries and limits to Pepper’s guardian. Enforcing these rules and boundaries in a timely fashion is how we can communicate to the dog what is and is not allowed. Additionally reinforcement of these rules is a great way to start redefining the leader follower dynamic between human and dog. After suggesting a few rules and boundaries I went over some nonverbal communication methods for peppers guardian to start using. An example of this is using body positioning and movement to disagree with Pepper’s barking or charging the door. It’s pretty common for a human to tell a dog to be quiet or yell at them when they start barking. However to a dog, this yelling is interpreted as the human agreeing with whatever the dog is barking at. But by using nonverbal forms of communication that mimic what dogs do amongst each other, we are able to help the dog understand that we disagree with the barking. Next I ran through a leadership exercise that I like to use. 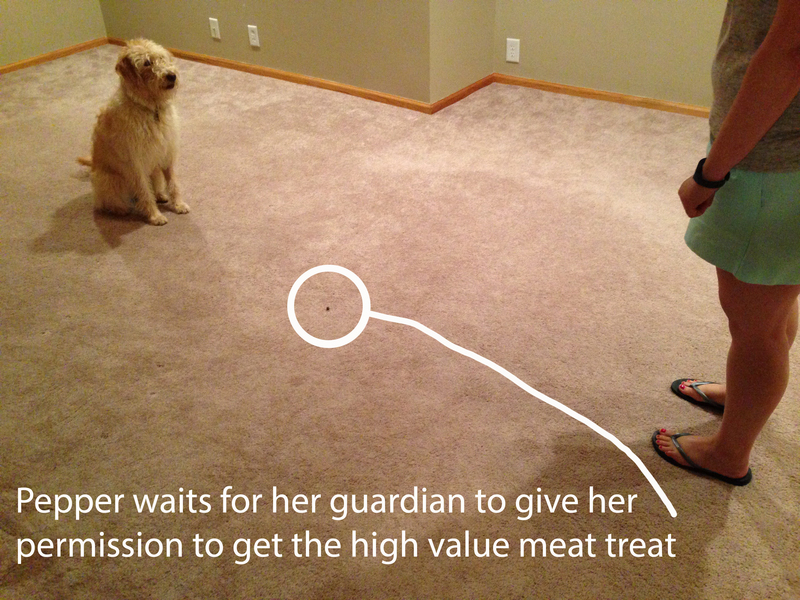 This exercise involves the dog leaving a high-value treat alone that is laying in the middle of the floor. By giving the dog as much access as possible and asking it to restrain itself, we can help the dog learn to develop the ability to self-restrain. We started out in the kitchen and I was able to run through the exercise a few times successfully. However as soon as Pepper’s guardian took over, the dog became easily distracted, preferring to move into the other room where she could look out the window and observe a few bunny rabbits in the yard. We moved into the basement of the home to eliminate the distractions and it’s a good thing we did. Instead of responding the same way that she did with me upstairs, Pepper attempted to circle and or go around her guardian to get the treat. This is a good indicator of a dog who does not hold the proper level of respect for their guardian’s authority. Usually a dog is able to figure out this exercise within 5 to 10 minutes, but in Pepper’s case, it took her guardian nearly 30 minutes before the dog finally gave up and communicated that she understood she was to leave the tree alone. As soon as the dog communicated this, I had peppers guardian give the dog permission to take the treat. We ran through the exercise a few more times to make sure that both Pepper and her guardian were using the right technique and understood how the exercise was conducted. 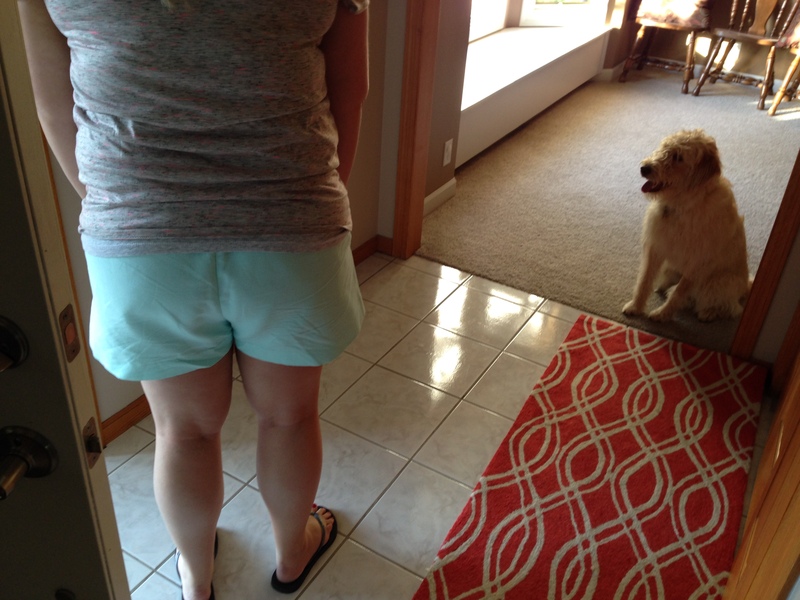 in addition to giving the dog the ability to practice restraining itself, this exercise also affords the human the ability to establish and reinforce arbitrary boundaries to the dog as it has to keep a three foot distance between itself and the treat on the floor. To test this new skill set, Peppers guardian called her next-door neighbor and asked her to come and knock on the door to trigger the response the dog usually displays whenever anyone arrives. Often when a dog barks and rushes the door, the human feels embarrassed and rushes to the door themselves. The dog usually interprets this rush as the human is nervous therefore it is right to bark at the intruder. It can also make the dog think that it’s bark is strong enough to make the human move faster. In either case, the dog has the wrong idea. As soon as the neighbor started knocking, I got up and walked in a normal pace to answer the door. I ignored Pepper’s barking and instead continued walking until I was up against the front door. Once I was at the door I turned around to face the dog, then started marching directly at it. This surprised Pepper and caused her to back away from the door. As soon as Pepper crossed the threshold from the tile in the entryway to the carpet in the living room, I stopped moving forward. By stopping precisely when the dog crossed the threshold I wanted it to stay behind, I was able to communicate to Pepper what I wanted in a way she understood. Once Pepper was behind the boundary, I started walking backwards towards the door while keeping my front facing the dog. As soon as I got to the door, I reached to the side with my hand and started to jiggle both the deadbolt and the doorknob. Each time Pepper heard a new sound, it triggered a response from her and she started to move forward. To communicate that I disagreed with this movement, I took a sudden and deliberate step directly at Pepper each time she crossed the boundary. It took three or four corrections before Pepper sat down behind the boundary and waited for me to open the door. By waiting for the dog to stay behind the boundary, Pepper was better able to restrain herself and keep her energy level at a reasonable level. This distance allowed me to open the door and greet the neighbor without Pepper rushing or jumping up on her. Next we asked the neighbor to repeat the process so that Pepper’s guardian could be the one that answered the door. This time Pepper did not bark when she heard the knocking, but instead rushed to the doorway ahead of us. Pepper’s guardian got up and walked at a normal pace to the front door, then turned to face her dog. She used the same movement that I did to get Pepper to back away and move behind the boundary. Each time she jiggled the handle or deadbolt Pepper started to move forward, so she disagreed with the dog by moving towards it the same way I did. It took a minute or two before Pepper got it and sat down behind the boundary to the door. Only when the dog was completely calm and behind this boundary did Pepper’s guardian open the door and let the neighbor inside. I suggested that Pepper’s guardian repeat this exercise with family and friends so that she and the dog can practice this new ritual of answering the door. In time, Pepper will learn to sit and wait for her guardian to handle answering the door and wait behind the boundary until the guest passes it before engaging with them. By practicing these exercises Pepper will learn to better control herself. This skill will pay dividends for dog and guardian when they encounter unknown dogs while out for walks. Its a gradual process that takes time and patience, but due to the dog and guardian’s energy and intent, I’m confident Pepper will learn to stay behind her guardian and follow her lead when she sees other dogs and animals on walks.